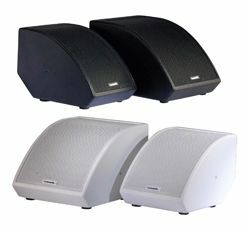 Community Professional Loudspeakers has introduced two new monitors to its M-Class Series. The new Community MX8 and MX10 monitors, available in black or white paint finishes. Handling 300 watts and 500 watts respectively, the 8-inch MX8 and 10-inch MX10 use Community's proprietary co-axial driver units. Their co-axial design means that all of the sound emanates from the same point source and the Tru-Phase conical high frequency waveguide eliminates the transition anomalies that occur in most square and rectangular horns. The MX8 and MX10 are ideal for single performers who often move off-axis and for group performers such as theater acts and choirs, the company says. These new M-Class monitors feature high sensitivity, permitting the use of smaller power amplifiers to obtain high output levels. Precision engineered internal crossovers eliminate the need for bi-amplification, reducing the overall system cost. The MX8 and MX10 also incorporate two further Community innovations. Carbon Ring Cone Technology increases the effective cone area for greater performance and reliability, while DYNA-TECH multi-stage limiter circuits protect against damage from over-driving, according to Community. A single rear Ergo-Grip handle offers convenience for portable applications. Optional yoke mounting brackets for flush mounting the monitors tightly against a wall or ceiling are sold separately.